Taylor and Obert were from Colorado Springs, CO, while the rest were from Winner. Many of their fans called them the Unknowns, so they soon added the “s” to their name. They played a wide variety of music styles, from pop songs of the 1940s through the Tijuana Brass, Everly Brothers, Chicago, and the Doobie Brothers. They learned songs that their parents liked. The Fabulous Unknowns were managed by Shannon Patrick O’Malley, who had moved to Winner from his native Yankton. He crafted their clean image, never allowing any smoking or drinking from the stage. They always tuned their instruments before taking the stage. This was more of a show band than a dance band. 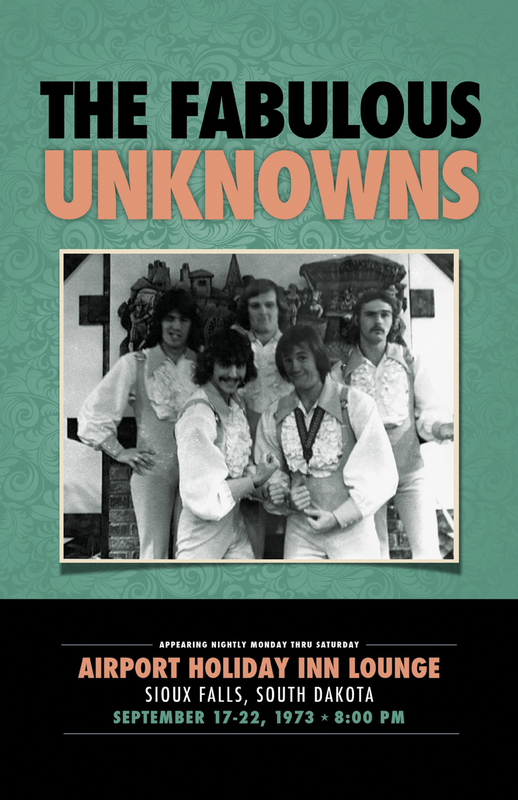 The Fabulous Unknowns performed occasionally outside South Dakota, but the Holiday Inns of Sioux Falls, Mitchell, Pierre, and Spearfish were their repeat venues. The Kochi Inn in Yankton also was a favorite spot for the band. Many photos remain from those performances. In April 1974, their final shows were at the Crest Show Lounge in Spencer, Iowa. Fun always was their priority, and it showed throughout their gigs. Many of the members still are active musicians.